I first found this place through a popular social discount website. Being a huge fan of noodle dishes and especially Japanese ramen, I bought in without hesitation. There are many Japanese ramen shops in Seoul offering tonkotsu-style ramen, based on pork bones boiled for a long time, supposedly over 10 hours. Speaking of the storefront, it can be a little hard to find the first time. 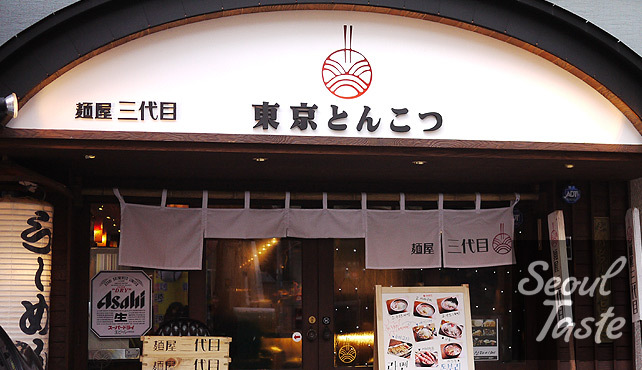 It is twice removed from the main road and their sign is written in kanji (麵屋 三代目) and English (Menya Sandaime). Curiously, there is no Hangul sign at all. So, follow the map and refer to this storefront picture. Once you step inside, it feels really cozy with just 5 tables plus bar seating. They have an open kitchen adjoining the bar area, similar to many other ramen shops. 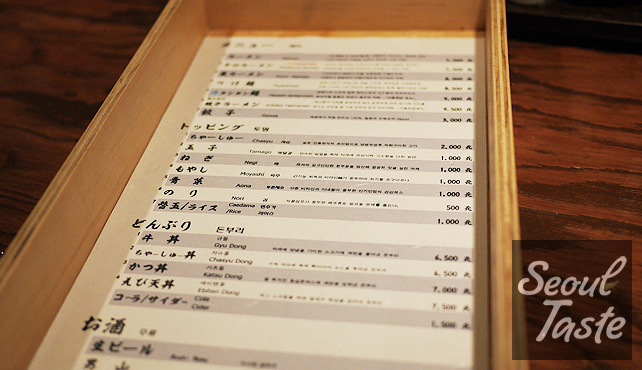 The menu is presented pasted inside a noodle tray, a nice touch. They are written all in Japanese kanji and small letters in Korean and English. You can choose from different styles of ramen and add toppings. You can also order donburi or gyoza on the side. The first time we visited, we were recommended Black Ramen so we ordered a bowl of that alongside their regular ramen for comparison. Black ramen turned out not to be my favorite though. It was flavored with a mix of donkotsu and bonito flakes, but for me, the flavor of the bonito flakes was so strong that it crowded out all the other wonderful flavors. The soup of the regular ramen is quite good, not too salty with complex pork flavors. Although we also tried the karaguchi ramen on a subsequent visit, we both agreed that it's best to stick with the standard ramen in the future. 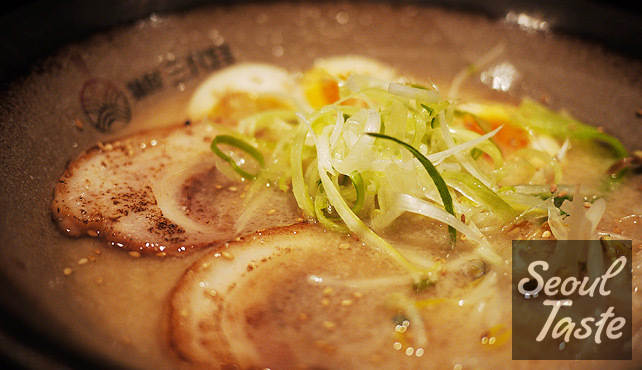 All the ramen styles come with two slices of thick chashu pork, half of a soft-boiled egg, a piece of baby bok-choy, mung bean sprouts and thinly sliced leek (negi). The toppings are not overpowering and prepared nicely. Sandaime is famous for making its noodles in-house, and when served, they come out pleasingly chewy, not mushy and overcooked. 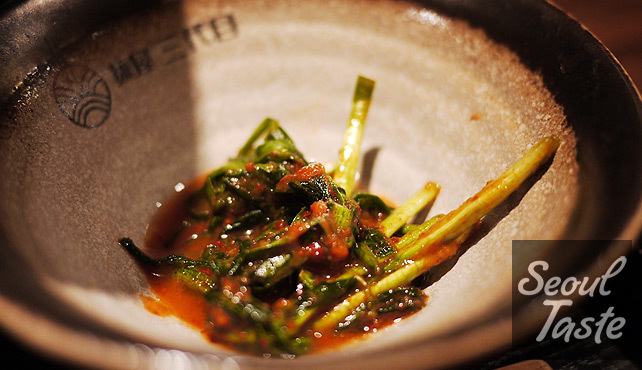 Curiously, each ramen comes with a side of chive kimchi, which is actually quite delicious. Chashu is especially good here. The pork is juicy and soft, with a good balance between meat and fat. They are also charred a little just before serving to add a roasty flavor as well. The first time we visited, we ordered toppings, thinking that perhaps the base ramen was totally plain, with no toppings. This turned out not to be the case: the topping selections are just there for you in case you want to double up on your favorites. I like to order an extra (whole) egg (for a total of 1 1/2), Aaron likes the basic ramen just the way it is. If you are a big eater or just extra hungry, you can order extra noodles. Extras are just another 1000원 - 2000원. Definitely try their gyoza! It puts a smile on my face every time I see it. It comes out all joined together by a thin, crunchy sheet of gyoza wrapper. The filling is juicy and it has that perfect balance between tender and crispy-crunchy. 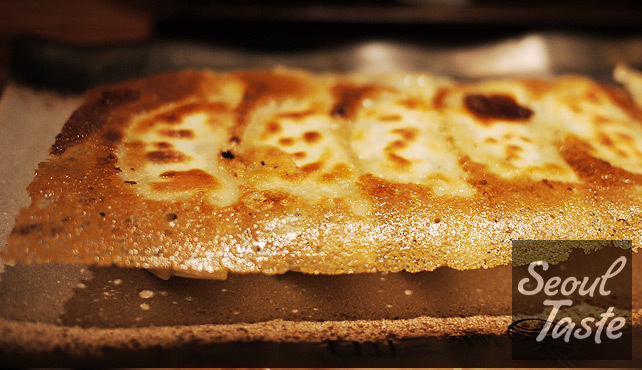 They give five pieces of gyoza so if you're sharing a plate, you may find yourselves fighting for that last piece. Food: 5/5 - Consistently satisfies my ramen cravings with finest attention to detail to a bowl of ramen. Atmosphere: 5/5 - Casual and comfortable. Bar seats thoughtfully provide a place for your bag in front of your feet (but off the floor). The place is small but doesn't feel overly crowded. Service: 5/5 - Feels like being in Japan as all the staff seem to be Japanese. Service is prompt and you always feel welcomed.